Veloce is Italian for fast, the Alfa Romeo Giulia Veloce would be a fast car. I can recently confirm that his name does, and more. They were four fantastic days! Earlier we drove all the Alfa Romeo Giulia Quadrifoglio. If you can’t choose which Residence best suits you, then this article, you might help. Now is the time to get to the Giulia Veloce to taste. About the design, you may judge for yourself. My opinion: beautiful, fantastic, magnificent, beautiful, desirable. Need I say more? The interior of the Veloce is sleek and soothing. The brown leather seats and black dashboard are both with beautiful stitching finished, and confirm also on the inside, with a very sporty car on the road. The interior is lined with beautiful, luxurious materials that a premium model would expect. In the Alpha you’re sporty, you have good seats. Of the driver’s seat the side bars, electric tighter or looser set, very useful if you have lots of turns on high paced rides. One thing what concerns me is the steering wheel just a bit too weedy to the touch. 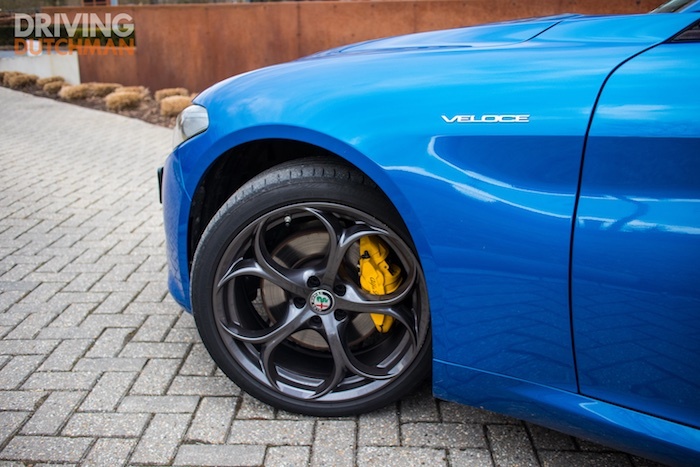 The performance of the Giulia Veloce are overwhelming. Four-cylinder, 2.000 cc, 280 hp, 400 Nm torque and permanent four-wheel drive, numbers where I can. Let me start with the four cylinders: that are more than sufficient to get the Veloce veloce in 5.2 seconds to 100 kilometers per hour just might be. 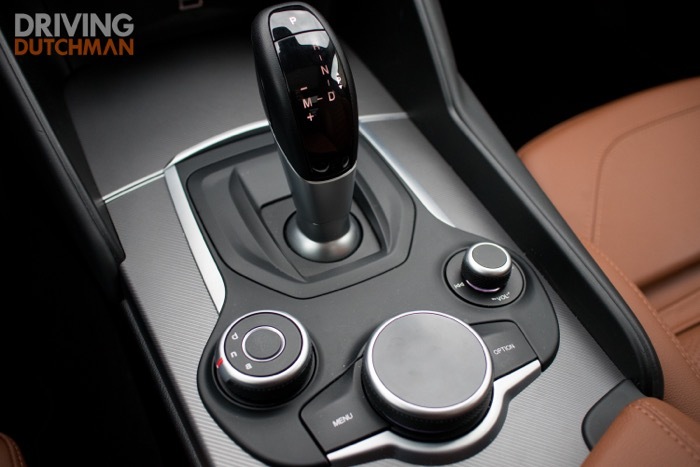 Thanks to the four-wheel drive and a seamless and fast shifting eight speed automatic transmission, there is a lot of grip, and feel the acceleration as if you were in an electric car. Electrically yes, because the noise level inside the Giulia is low. What freedom is concerned, of course, totally fine, but in this car you will want the ability not only to feel and see, but also hear. But none of that, you can hear the engine and exhaust barely, what is so pleasant as you for a long time with the Alpha. Maximum points will get the Veloce from me for its support. This car is front/rear and left/right so well balanced that it is a great pleasure to bends. The Giulia sends so sharp and tight that it is a dear delight. Once for what turn also positioned, does the Veloce is not more of his off-course. This sharpness and balance I have long not more felt in a car. Alfa Romeo have made it to the ride. 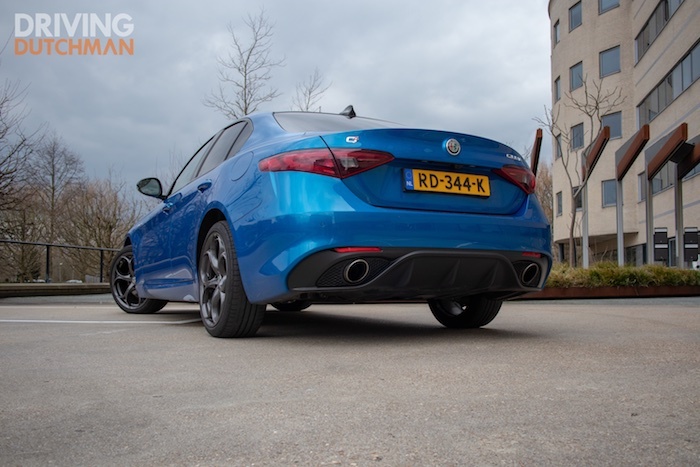 The DNA driving modes of the Giulia cause a clearly noticeable different handling characteristics. In the A-mode is the Veloce really not looking forward to burning and may even seem as if he is about and doesn’t want to. Very different is that all of the N-mode. The frame is in this position comfortably, while the car’s already sporty feel. The bear is, however, really loose in the D-mode. The engine in this position, everything he has, and the chassis is as hard as a brick. Do you want the motor, but not have the feeling in a kart? Press the DNA button, and the damping is softer. But still good enough to start hard. 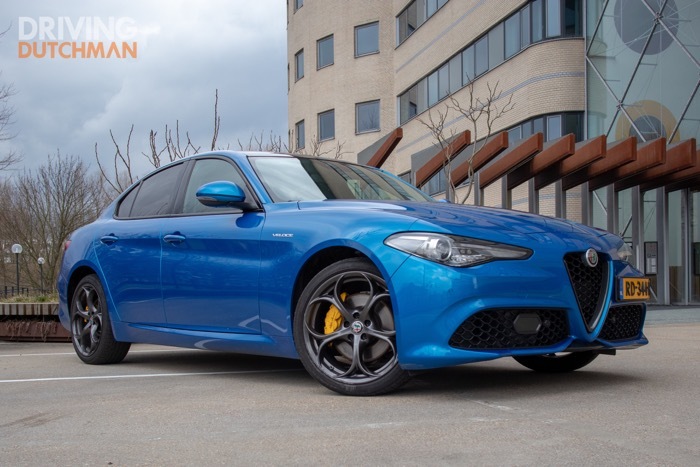 The Alfa Romeo Giulia Veloce of everything: luxurious, sporty and comfortable. What you want, but it’s in it, and also, when you want. The sporty aspirations of the Veloce are phenomenal and make you forget that there are other cars that very well. Alfa Romeo has with the Veloce a benchmark framework put where top brands have to go so that they may, the battle is not going to lose. The Veloce is in the price list from almost 55 thousand euro. Before you buy a good wegauto, which you also without you to be ashamed of trackdays can drive. The Veloce is ready for the circuit. And it doesn’t matter which circuit, because the schizophrenic Alpha also has a sweet side, that you are relaxed and fitted to every desired destination. And in the A-mode can do that even with an average of 6.4 litres per 100 kilometres, and that is quite ok for this veloce boy.